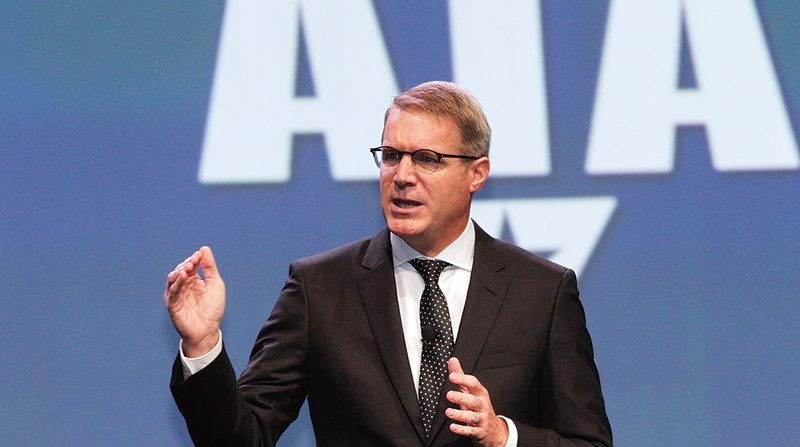 “In 2018, we really want to underscore the federation and the importance of unity,” ATA President Chris Spear said in an interview with Transport Topics, noting that working together has helped ATA this year mark a milestone. “The emphasis of strength of the federation — 85 years of representing 50 state associations at the national level,” Spear said. Spear will discuss the opportunities and challenges facing the industry during his state of the industry address Oct. 29. He said this MCE will highlight many of the areas where the trucking industry can continue to make inroads in state capitals across the country. “We’re seeing a lot of policy-making occurring at the state level,” he said. Spear also pointed out that this year’s keynote speaker at the ATA Advocacy Luncheon on Oct. 29 is Tennessee Gov. Bill Haslam, whose family has ties to the trucking industry through its ownership of the Pilot Flying J truck stop chain. As governor, Haslam has emphasized the need for infrastructure improvements. The Trump Administration has proposed a $1.5 trillion program to rebuild the country’s crumbling highways, roads, bridges and airports. However, the proposal includes just $200 billion in federal funding, with the private sector providing the balance. The White House has held several events to promote the need to rebuild the nation’s infrastructure, but the issue has gained little traction in Congress. Attendees at the show also will hear from Federal Motor Carrier Safety Administration Administrator Ray Martinez, who is slated to speak on Oct. 27. In the past 10 months, FMCSA has navigated the industry’s transition to electronic logging for drivers’ hours of service and now is taking public comments as it considers changes to HOS regulations. Meanwhile, the industry continues to grapple with a driver shortage and high rates of turnover. A recent ATA report showed driver turnover at large truckload fleets during the second quarter increased by 4% year-over-year to 98%. Dozens of companies have raised driver pay and continue to offer lucrative bonuses to recruit or retain drivers, while others offer drivers and their families full college tuition, employee stock ownership programs and more. Besides the exhibition show floor at the Austin Convention Center, several educational sessions will be held on issues facing the trucking industry. Topics include driver recruiting, the move toward blockchain and HOS issues.